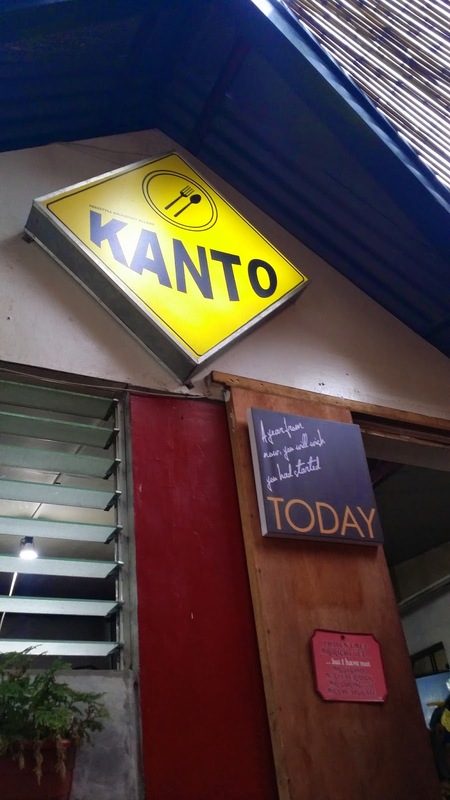 Food Escapade at Kanto Freestyle Breakfast | Vanity and Everything in Between. Kanto Freestyle Breakfast has been around for a while now. Basically it's an all day breakfast restaurant that is open for 24 hours. Yes, 24 hours! It's not a high-end restaurant but their food is good. 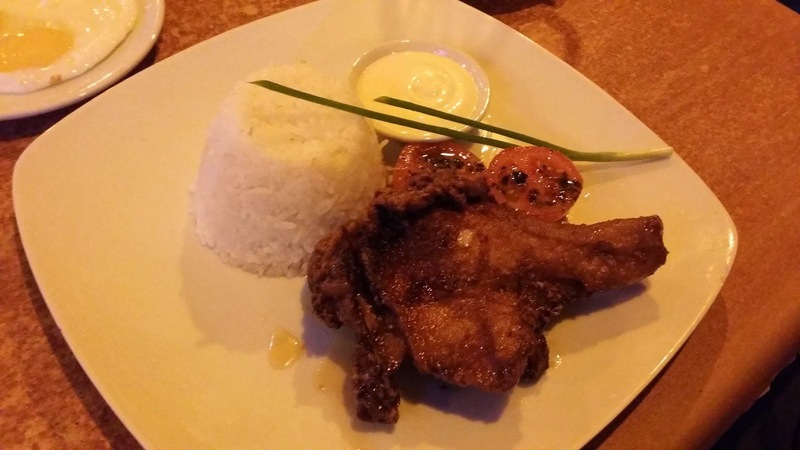 Your PhP100 could buy a decent meal. 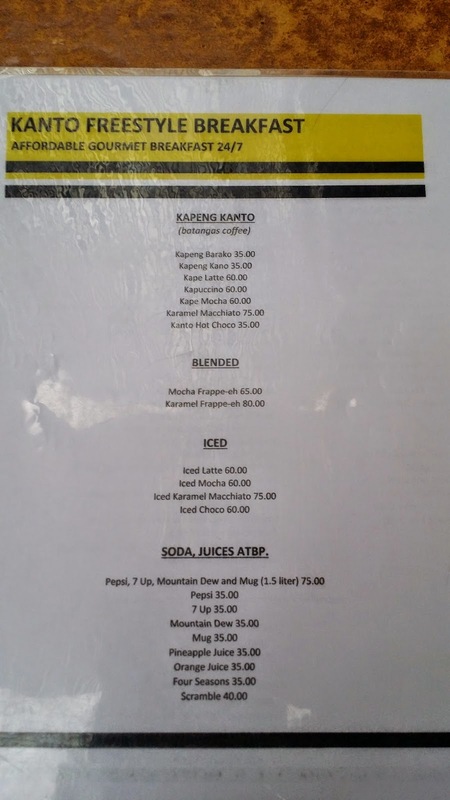 I took a photo of their menu. 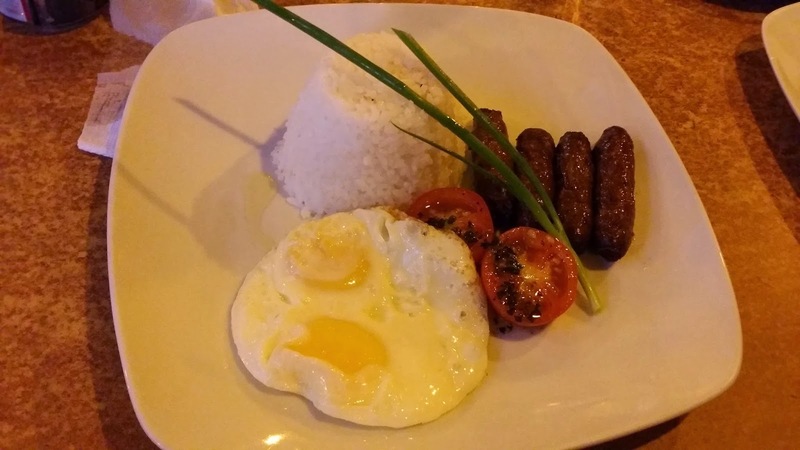 Most expensive meal is PhP110. We also ordered Tsoknut Champorado but I forgot to take a photo of it because I was too excited to taste it when it was served. Mom, L, and I had late dinner at Kanto - around 11pm - and the place was still full. There was actually a waiting line when we arrived. Kanto Restaurant is unlike most fancy restaurants. For one thing, it's open air. Tables and chairs are plain. But the food is really good. Their Honey Garlic Chicken tastes better than BonChon! The Pampanga Tocino was so tasty. I was supposed to give L one piece but I ended up eating all! Although, the Tsoknut Champorado didn't impress me. 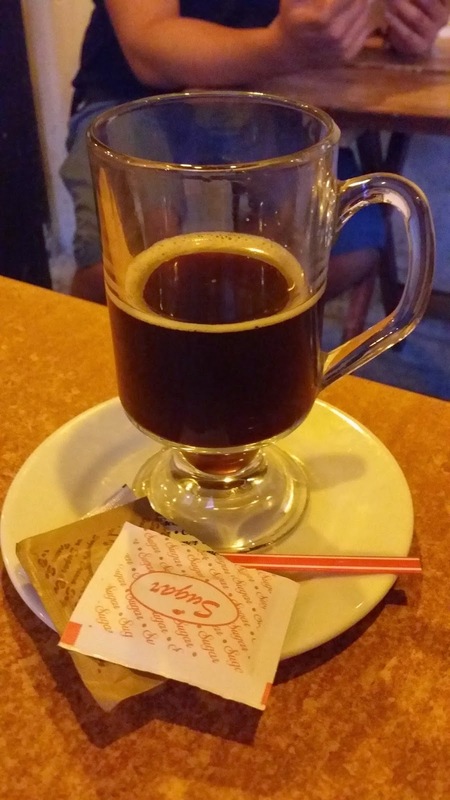 I didn't like the taste. I found it weird cos I couldn't understand the combined taste of Tsoknut and champorado. The color looked livid, too. Oh yeh, I forgot, we also ordered pancakes! It had bananas and peanut butter! It was a good one but we weren't able to finish it cos it was like 3-4 pancakes with bananas and peanut butter in between. Overall, we liked our experience so much that Mom and I actually came back the following night too try their other dishes. 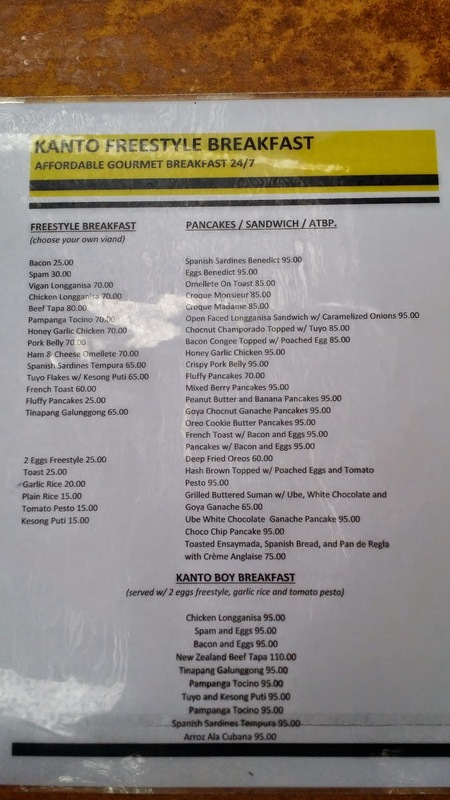 Kanto Freestyle Breakfast is located in Bo. Capitol, Pasig City. They also have branches in Mandaluyong and Quezon City. Your mother has sense of humor huh hehe.I think you are really close to her.And wait,there's a food there that tastes great more than Bon Chon?Oh wow! UGH! I'm in love with this hole in the wall resto! 2x na ako kumain dito and super love ko. I love their Egg Benedicts. Lakas maka-sosyal pero sobrang mura. Kaso unahan nga lang sa upuan! LOL! Anyway, my friend brought us to their Mandaluyong branch once and we really enjoyed it! Now I am craving for their tapa. Thats probably the biggest misconception about me hehe. Di ako sosyal :) I really like Kanto. Sarap ng food!! Yes po, masarap nga kumain dun. On our next restday, dyan na schedule namin :) You really are so beautiful, inside and out!